New year, new hopes, lot of new things to learn and lot of new promises to be made. Everyone likes to think they are different. We are the same but let me assure you its not just talk. Frankly, we try much harder to offer a more attentive, imaginative and enhanced learning experiences. When calendar changed to 2019, we also made few changes to make our system more useful and easy to handle. Also we wanted to stay current with the latest developments like pocket cards, soft cards, online certificates, quick checks on certificates, etc. 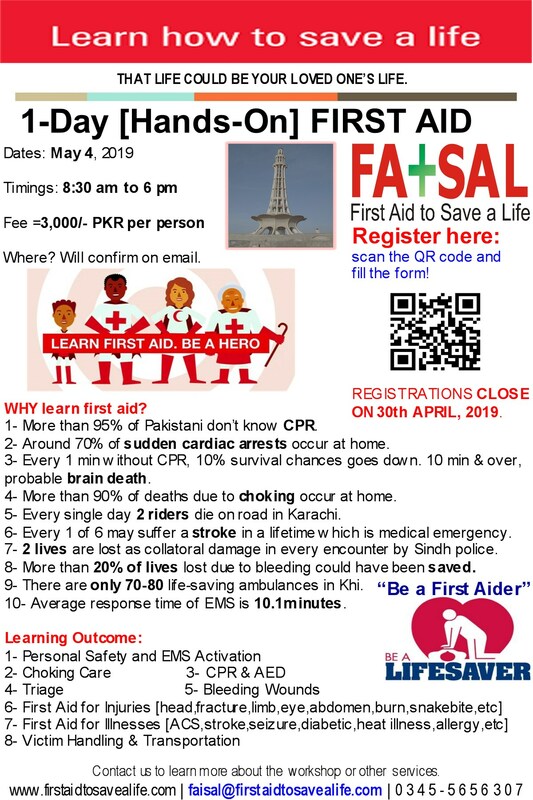 We have moved on and reached to next step; where certificates issued by First Aid to Save a Life to individuals after successful completion of course have QR codes on their certificates which will allow them and others to access the online copy of certificate. Onward from 2019 we will issue pocket certification cards so that those would be readily available to put on table and clarify the type of first aid training you have and your level of skills. In 2019 there will be big NO to fake/forge certificates. Anyone (like employers, interviewer, etc) can check if the presented certificate is genuine or not by scanning the QR. Also the detail content covered during the course would be mentioned on online copy of certificate accessible through QR. We can be where YOU NEED us. We are also reaching to more locations in 2019. We will offer more regular courses in Karachi and also announce courses for Faisalabad and Peshawar.